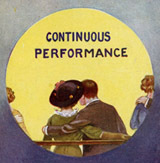 Continuous Performance: Going to the Cinema a Hundred Years Ago is an exhibition marking the centenary of cinema-going in Britain. Well, we can argue the point whether 1909-2009 is any real sort of centenary, since pedants like me would point to the first British cinemas having appeared in London in 1906 (specifically, the Daily Bioscope opposite Liverpool Street Station gets my vote as cinema no. 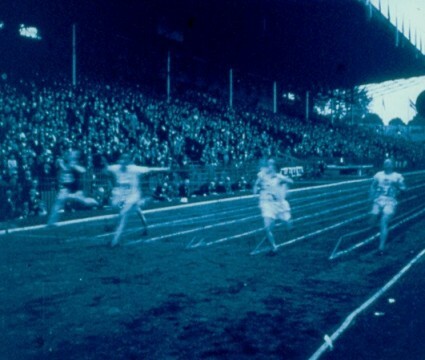 1), but 1909 was undoubtedly the year when the phenomenon undoubtedly took off in a huge way and started to make such a great impact upon society. The exhibition is taking place at the Templeman Library, University of Kent, Canterbury, as part of the Canterbury Festival. The exhibition celebrates the first film shows and their audiences through cameras, projectors, books, photographs, fan magazines, and other ephemera from the early years of the cinema. The exhibition has been put together by Dr Nicholas Hiley, head of the university’s world-renowned British Cartoon Archive and a great collector of early cinema apparatus and memorabilia. The Bioscope plans to visit the exhibition soon and to review it in detail, but as that may take a week or two as yet, do note that it is open Friday 2 Oct – Friday 6 Nov, Mon-Fri 8.45am – 10pm, Sat-Sun 12pm – 7pm. Admission is free, and you get to visit the fair city of Canterbury into the bargain. However low were the family’s finances, most parents tried to afford one penny for each of their children to visit the local cinema on Saturday mornings. I think there was method in this sacrificial attitude, and mothers could be forgiven for an innocent piece of blackmail. What better reason for withholding the entrance money, if certain jobs weren’t accomplished, before being allowed to see the latest episode of the exciting thriller that had been eagerly discussed since last week’s instalment. Also, most mothers thought that to be rid of her offspring for two or three hours was no bad thing, and at least they knew where their children were. There were two picture palaces in the district, each competing with the other to show films that would fill their halls with screaming children each Saturday morning at ten o’clock. The proprietors no doubt were pleased to see a long queue of waiting customers, but whether the manager and his brave staff were as enthusiastic, is open to doubt. However, the preparation of the showings were arranged with considerable thought. 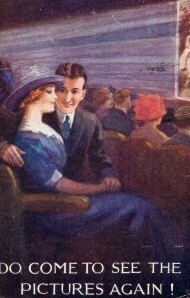 While each cinema had to provide a lengthy and attractive programme to ensure everybody had their money’s worth, the manager had to allow his staff sufficient time after the children had gone, to prepare for the adult programme starting early in the afternoon. It must have been a daunting task each week to clear the floor of sweet bags, orange peel and apple cores, thrown down by anything up to three hundred children. The doors were opened and we filed in dropping our pennies into a box on the table, under the eagle eyes of two large gentlemen whose principal job was to see that no one disappeared through the curtains before their hot little hands had released their pennies. Once inside we scrambled to a seat, often resulting in skirmishes reminiscent of the action we were about to see in the films. There were another two attendants inside supervising the seating arrangements, but as I remember, they quickly lost heart when they saw the unruly and unorthodox manner the children chose their seats. Miraculously, as soon as the curtains parted to reveal the screen, everyone was settled and cheered the announcement that the first film was to commence shortly. It was now that my praise of the management’s timing showed itself. Just as we were becoming restless, the lights went out and the beam from the projector showed on the screen. Usually the first film was short and lasted about five minutes, and was probably a testing exercise to see that the apparatus was working correctly; it also allowed the lady pianist, seated below the screen, to be ready for her marathon performance. I still wonder at her marvellous concentration and ability to keep her eyes on the events of those silent screens and the synchronization of her hands to fit the action. 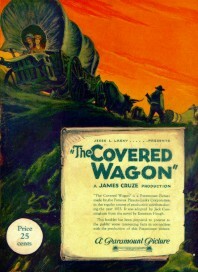 Immediately the introductory film finished, the title and captions of the main feature appeared. No time for the boy behind to be tempted to stuff orange peel down your collar, or to crawl under your seat and tie the laces of your boot together! There was silence until the film got underway, then the piano gave the clues of the story. The pianist thumped the keys fortissimo when the hero was hurrying to rescue the heroine from all sorts of terrible fates, and we gave him every encouragement by raising our voices to a deafening pitch. It was when the leading lady’s baby was desperately ill, that the pianist gave her best. Soul stirring melodies were played in unbelievable silence, and the boys had to be on their guard not to be caught crying with the girls. Of course justice was seen to be done, and had we been able to reach him, we would have assisted the hero to throw the villain off the cliff. The end came with most of us standing on our seats cheering the epic drawing to a close. With little or no time, in order to prevent private wars breaking out between children in the audience, the weekly serial appeared, and we had a few seconds flash-back to recount to the unfortunates who hadn’t been able to attend the previous week, what has so far taken place. ‘Pearl White’ and ‘Elmo the Mighty’ are names which only the very elderly will recall, but it is possible those not so old will remember their parents tell of those pioneers of the screen. ‘Elmo the Mighty’ is Elmo Lincoln, who would become the cinema screen’s first Tarzan. The makers of those serial films really knew their business and their audience. Our hearts beat fast when the train carrying the heroine approached the damaged railway viaduct, and the gallant hero tried to bring his galloping horse alongside to warn the train driver of the peril. It had come to an end, and we were left with feelings nearly as emotional as the film, realizing it would be a whole week before we knew for certain whether our favourite would be in time to save his sweetheart. As we jostled our way out, the relief of the watching attendants can only be guessed. Then they made a systematic check by turning up the seats and examining the toilets, in case someone had secreted themselves away in order to see the adult programme without paying. Arguments took place on the way home, trying to guess what would happen the following week, and our parents were of little help; when relating the exciting finish to the serial and asking whether everything would turn out the way we wished, they smiled and irritatingly said we would just have to wait and see. Goldman concludes with an interesting insight into the difference between the child’s and the adult’s cinema-going experience, indicating the way in which cinema had moved from its earlier, rumbustious state to an ordered world where social pressures demanded conformity. Very rarely, perhaps on my birthday, I was taken to the cinema by my parents. These visits were in complete contrast to the Saturday morning adventure, principally because we went in the evenings, and coming home in the dark was part of the grown-up world which I didn’t experience very often. Mother and my sisters were always eager to go, but Father had to be coaxed. There were two feature films, and provided one of them was a western, he would be agreeable to come with us. I approved his taste, and hoped that if the other film was a love story, it would be shown first, so although having to endure it, I could sit and anticipate the fight between the cowboys and Indians later on. Of course the quiet and peaceful atmosphere of the hall although nearly full, was in sharp contrast to the morning’s performance. For instance, with everyone orderly, there was no need for attendants to be waiting to throw out anyone misbehaving, and was therefore an early glimpse into the future and what was expected of me when I grew up. A delightful piece, I hope you’ll agree, evocative and informative. The latest addition to the Bioscope Library is a welcome example of a modern film scholarship text made freely available online. 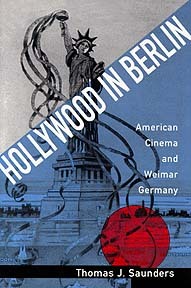 Thomas J. Saunders’ study, Hollywood in Berlin: American Cinema and Weimar Germany, looks at the American film in Germany during the Weimar period. 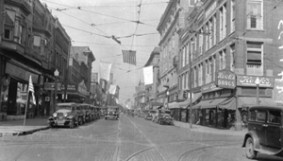 German films of the 1920s have been much championed and studied, in part as alternatives to American films of the period, but the focus here is on the considerable impact American comedies, serials, society dramas and historical epics had in Germany, and the debates they occasioned on the influence of cinema and the perils of Americanisation. Films covered include The Ten Comandments, The Hunchback of Notre Dame, Ben Hur and Greed, and the image and impact of Jackie Coogan, Mary Pickford, Harold Lloyd, Rudolph Valentino, Chaplin, Keaton and ‘slapstick’ in general. The book therefore looks at cultural and industrial relations between Germany and America in 1920s, through the prism of popular cinema, bringing together economic history, reception studies, film studies and social history. The book has been published online in chapterised, word-searchable, web form as one of the California Digital Library’s eScholarship Editions, a welcome initiative to make sample scholarly text freely available online to demonstrate its range of publications. Another example from the same source, already in the Library, is Charles Musser’s Before the Nickelodeon. Academic publishers, where they are rich enough to do so, are increasingly experimenting with multi-platform strategies, making texts available in print, online by subscription or to a restricted group (many of the eScholarship Editions are available only to University of California staff and students), and a few titles (or sample chapters) available free to the public. It breaks down barriers, demonstrates the flexibility of text, encourages discovery. More such forward-thinking initiatives, please. In the last post, on the Lynds’ Middletown, there was a footnote reference to Cyril Burt’s The Young Delinquent. That 1925 text has now also gone into the Bioscope Library. This renowned study of the phenomenon of youth crime (source of the illustration, left) was an early work of British psychologist, Sir Cyril Burt (1883-1971). Burt is best known for his work in educational psychology, and is controversial for his ideas on heredity and intelligence, and for possibly having falsified some of his research data. The Cinema. One feature among the attractions of every town and suburb a feature already mentioned more than once demands discussion at some length. The cinema, like the ‘penny dreadful’ before the advent of the film, has been freely censured and abused for stimulating the young adventurer to mischief, folly, and even crime. Among those who criticize it on this ground, the most credible are teachers of wide experience and magistrates of high standing; but perhaps none is so eager to advocate this view as the young culprit himself, who frequently sees, or thinks he sees, in such a derivation of his deeds a chance to deflect blame and attention from his own moral laxity to that of the producer of films. On sifting the evidence adduced by those who express these fears, it is plain that both their inferences and their psychological assumptions are by no means free from fallacy. Nor are their facts better founded. They have between them hardly one well-attested instance from their own first-hand knowledge, hardly a single analysed case to put forward in proof. That certain children at certain ages are highly suggestible and imitative, I am far from wishing to dispute; and, beyond doubt, the peculiar conditions of cinematographic reproduction heighten this natural susceptibility still further by artificial means. 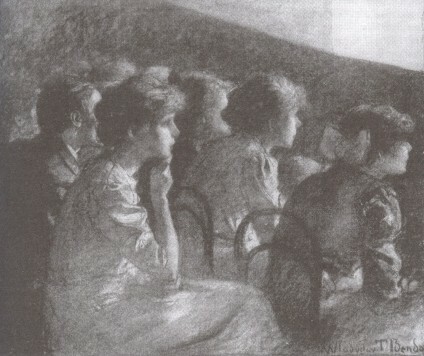 The darkened hall, the atmosphere of crowd-excitement, the concrete vividness of visual presentation, the added realism due to movement and to the play of facial change, and, above everything, the intensely sensational character of the emotional scenes portrayed all are calculated to increase the child’s suggestibility, and to stamp upon the impressionable mind graphic images and lasting recollections. Mental pictures, so deeply imprinted, may sometimes issue in obsessions haunting and irrepressible recurrent thoughts and impulses bound from their very persistence and strength to work themselves out by action. All this is not to be denied. Yet, of the ensuing acts, how much is crime? Most of the characters and situations rehearsed by film-smitten children are as innocent as those of any other piece of childish make-believe. Who has not seen street-urchins mimicking Charlie Chaplin, holding each other ‘up’ with toy pistols, or masquerading in the feathers of Red Indians or the wide-awake hats of cowboys, every flaunted detail manifestly picked from the romances of the film? Even where the model is a heroic pirate or bandit chief an Arsene Lupin or a Long John Silver the adventures themselves may be as innocuous as those of Tom Sawyer or Huckleberry Finn. The direct reproduction of serious film-crimes is, in my experience, exceedingly uncommon: and, even then, it is usually the criminal’s method rather than the criminal’s aim that is borrowed: the nefarious impulses themselves have been demonstrably in existence beforehand. Burt found only four or five incidents where a child, ‘dull or defective’, had commited a crime directly inspired by the cinema. the temperament of the typical thief is just the temperament to which the sensations of the picture-house appeal most strongly; he comes from just the dreary, comfortless home which makes the cinema almost his sole means for mirth and amusement; hence, the union of the two habits the habit of stealing and the habit of picture-going a coincidence rightly observed to be significantly frequent, is not so much a matter of effect and cause; it is the double by-product of a deeper common source: the underlying adventurous nature of the child, for which his humdrum life affords no satisfying outlet, animates and penetrates them both. The attraction of the cinema, therefore, can be counted as a direct incentive, only where the child has acquired an over powering habit, an inveterate taste and craving, for that particular form of diversion. Throughout the usual picture-palace programme, the moral atmosphere presented is an atmosphere of thoughtless frivolity and fun, relieved only by some sudden storm of passion with occasional splashes of sentiment. Deceit, flirtation, and jealousy, unscrupulous intrigue and reckless assault, a round of unceasing excitement and the extremes of wild emotionalism, are depicted as the normal characteristics of the everyday conduct of adults. The child, with no background of experience by which to correct the picture, frames a notion, altogether distorted, of social life and manners. The villain or the vampire, though outwitted in the end, has nevertheless to be portrayed with a halo of fictitious glamour, or interest would flag: he does wrong things; but he does them in a smart way, with daring, gallantry, and wit. It is true that, in most of the plays, the scoundrel is infallibly unmasked and eventually requited. But the hollow and factitious character of this pseudo-poetic justice seldom deludes the most youthful spectator. For Burt, those very qualities of cinema that could be argued to be its greatest virtues – namely, its appeal to the imagination and the encouragement of fantasies – are to be seen as its leading vices, at least for the unbred young. They provide models and material for all-engrossing day-dreams; and create a yearning for a life of gaiety a craze for fun, frolic, and adventure, for personal admiration and for extravagant self-display to a degree that is usually unwholesome and almost invariably unwise. When all is said, however, it is easy to over-blame the cinema, to exaggerate the actual harm and ignore the possible good. It is clear that, in comparison with the incalculable number of films that are manufactured and released, the offences resulting are infinitesimally few. The victims are almost wholly those who, temperamentally or otherwise, are already disposed to anti-social conduct; and the cinema can do little more than feed and fan the latent spark? The Young Delinquent inevitably tells us more about the prevailing attitudes of the moral authorities rather than the youth themselves. It is interesting for what it reveals of the fear of youth crime in period earlier than we might normally expect, and for the association many made between cinema and delinquency. Interestingly, Burt ultimately does not put the ‘blame’ on heredity, the theme of his later work, but on environment. Cinema was a common feature of ‘low’ environments; it was therefore damned by geographical association. The Young Delinquent is available from the Internet Archive in DjVu (38MB), PDF (43MB) and TXT (1.5MB) formats. For earlier (1917) anxieties about the connection between cinema and crime, see last year’s post on The Cinema: Its Present Position and Future Possibilities, the deeply-biased but highly recommended report from the National Council of Public Morals (what a name! ), also available from the Internet Archive. For a fine social history of the young from 1875 to 1945, with much on the association in the public mind between youth, anti-social behaviour and cinema, see Jon Savage’s Teenage: The Creation of Youth, recently out in paperback. For a summary of Cyril Burt’s work, and the ongoing controveries surrounding him, see Indiana University’s Human Intelligence site. “An audience is never wrong. An individual member of it may be an imbecile, but a thousand imbeciles together in the dark – that is critical genius.” Billy Wilder made this comment about audiences but just how much do we know about what film audiences think and how often are they credited with being geniuses or more often seen as imbeciles? Empirical research into film audiences is a small but developing field and this conference continues its aim of providing a space where those involved or interested in this area can come together to share research findings and discuss future ideas. Whilst the conference will appeal primarily to academics it is not confined to them. Previous conferences have had contributions from those directly involved in the film industry and this is to be welcomed. We are very pleased to announce that the opening and closing speakers have been confirmed. The opening speaker is Professor Ian Christie, from the School of Art, Film and Visual Media, Birkbeck, University of London. He is Vice President of Europa Cinemas, an EU funded organisation which supports exhibitors throughout Europe who show European films, and a Trustee of the Independent Film Parliament. He is also a regular reviewer and broadcaster on film matters. The closing speaker is Dr Sean Perkins. He has been Research Executive at the UK Film Council since 2001. His research interests include UK and global theatrical markets, the UK video and online markets, film on television and film audiences. He has managed research projects on the impact of local cinema and a qualitative study of avid cinemagoers. There is only one criterion for proposed papers: they should be concerned with empirical research into film audiences. The audiences can be anywhere in the world and for any genre of film. They can be historical pieces of work that explore the construction of film audiences through governmental policy or pieces that look at the construction of fans via archival material. We are happy to receive abstracts from students and new researchers as well as established researchers no matter what their background is. The conference takes place over two days in the heart of Edinburgh. One of the main attractions for participants is that we only run single track sessions – no more difficult decisions about who to go and listen to or the awful experience of presenting to just a couple of people whilst everyone else has gone to hear the famous speaker! Everyone is guaranteed a decent audience plus 30 minutes to present their paper followed by 15 minutes of questions – and we are very proud of our reputation regarding time-keeping. Abstracts of no more than 300 words should be submitted as virus-free MS Word or rtf attachments, to Dr Ailsa Hollinshead no later than 31st August 2008. Abstracts will be reviewed by external referees and all contributors will be notified of the outcome by 30th September 2008. 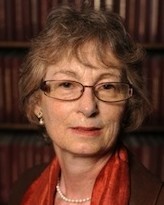 Copies of the conference paper will have to be with Dr Hollinshead by mid January 2009. There will be a bursary for the best student paper, which can include undergraduates as well as postgraduates (subject to proof of status). Successful candidates will be expected to book a place within one month of their paper being accepted. Costs and application forms can be obtained from the conference website. More information is available on the conference website, including abstracts from last year’s conference.